Not at all what I think of when I think of Cattleya (in fact, some of what I think about when I think about Cattleya are probably not even Cattleyas, at least not pure ones), but it's not uncharming. I still prefer the color of the cross with Lc. Rojo, but as they say, I wouldn't kick this one out of bed for eating crackers. Though in point of fact, I would kick anybody out of bed for eating crackers, 'cause, dammit, it's a bed. If you have to eat something, you could at least make it something that's not going to splinter into a million pieces and get all ground into the sheets and stuff. If somebody's insisting on eating crackers on a piece of furniture which is clearly not designed with cracker-consumption in mind, and doesn't see how that's a problem, then I don't think we're likely to have that long of a relationship anyway. And who eats crackers as a snack anyway, crackers by themselves? I mean, I do, sometimes, but that's mostly because they require no preparation at all and I'm very, very lazy when it comes to food. But I assume that other people don't sit down with a sleeve of Saltines and start chowing down. And I certainly don't eat just crackers, in bed, with someone I don't know well enough to have had the crackers-in-bed conversation with. So no. I'd have to be like, um, _________, you're going to have to leave the bed for a little while if you want to eat crackers. And then when you're finished eating the crackers, you should come back and we should maybe have a talk about foods which are and are not appropriate to eat in bed, and maybe we should also talk about exactly where you see this relationship going if you're not going to be respectful of my desire to not be rolled in cracker crumbs against my will. In any case, I do approve of the flower. I think the flowers are a little boring. The peek into your psyche? Fascinating! What do you think vacuum cleaners were invented for? Disgust and contempt for eating in bed finds grace in my eyes. That's as bad as eating on the toilet. Orange flowers rule, though I'm not quite sure I like orange orchids. They seem a bit off, somehow. I never set out to eat just crackers (and never in bed) but occasionally I run out of whatever I'm eating the crackers with (usually cheese) and I continue eating the crackers until the sleeve is gone. This is one of the many reasons that I need to lose about 40 lbs. I love that colour of orange - it's lovely. but in response to Paul - eewwww - eating on the toilet!? Efficient but disgusting. Liza, Karen715 - have you seen many other orchids? If you have the chance, you really should go to an orchid show especially if it is one of the bigger ones...perhaps one day you might take a vacation in San Fran and be there when they have the POE in progress...the next one is in the 1st week of March 2011...or the show at Longwood Gardens (next one probably end of March 2011). 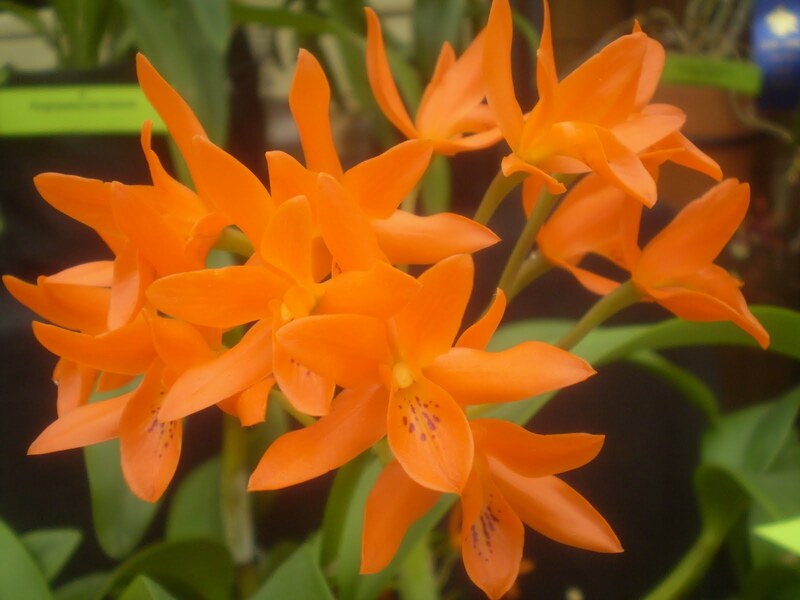 mr_subjunctive, what do you think of when you think of a Cattleya? Something probably in lavender tones with a large, frilly lip? Pretty much. Pink, purple, pink-purple, white, lavender -- that general color area. I mean, I'm perfectly aware that not all cattleya alliance flowers are like that, but I think of what I think of, so sue me. I was merely thinking that perhaps you are more familiar with the Catts that the garden center you worked at would be likely to have got for sale.